【SAWA CORPORATION】SC-AH100 | Products （Metal Stencil Cleaner ）| MASS CO., LTD.
Less damage to metal stencil. Using Low VOC solvent can reduce organic solvent consumption that harms human health and environment. Low volatility of solvent can contribute to low running cost. 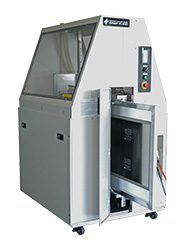 Simultaneous process of cleaning and drying can realize a high-speed cleaning. FCC compliant models is available. Please ask for details.